Algeria, as an African country that provides a high average rate ranging from 16 to 21 cents per minute, is a promising direction for terminating GSM traffic. There are quite a high mobile penetration and cheap SIM-cards. But for a successful VoIP GSM termination business, high-speed Internet is also needed to ensure the smooth operation of gateways. 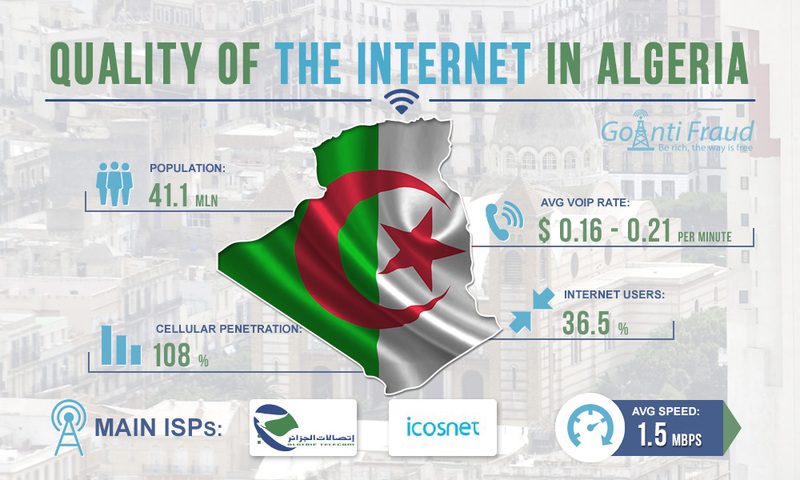 Until recently, the Internet services market in Algeria was at a very low level of development. There was a monopoly of state-owned telecommunications company Algerie Telecom. The lack of competition led to high tariffs and delays in the new services. At the same time, Algeria is considered one of the countries with the slowest Internet in the world as the average download speed varies from 1.5 to 2.5 Mbps, with some areas still not connected to the Global Network. After the social and political unrest in 2011, Algeria's telecommunications market began to recover, with the infrastructure quite developed to date, mainly due to the creation of a national fiber optic mains and a new underwater cable in Valencia. In addition, together with partners, a new landline network Trans-Saharan that is 4,500 kilometers long, is being built. The development of the broadband market in the country has long been hindered by the limited coverage of fixed-line networks and the lack of infrastructure. This was the reason for investing in wireless Internet access technologies. In 2013, LTE networks were licensed, which provided access to mobile Internet throughout Algeria. This, in turn, has become a prerequisite for reducing tariffs for broadband services in recent years. Algerie Telecom continues to invest in expanding its own fiberoptic infrastructure, while the government has allocated funds for the national broadband development program. It is projected that by 2020 the situation in the market of Internet services in Algeria will improve. As of early 2017, the penetration of the Internet in the country is 36.5%, which is about 15 million users. To terminate international voice traffic in Algeria by means of a VoIP gateway with the router, you can use equipment that has a small number of channels at one location since the connection speed is quite low. It is better off placing gateways in the large cities of Algeria: Algiers, the capital city, Oran, and Constantine.